Wow! This one was different. Good different. Great different. Side note: how fudging cute is this cover?? In case you didn’t already know, I’m a Brit. More than that, I’m a Brit that’s never been to America *sigh* so not only was Amy and Roger’s Epic Detour a great story, for me it was also a giant dose of culture. This story reads like a journal. 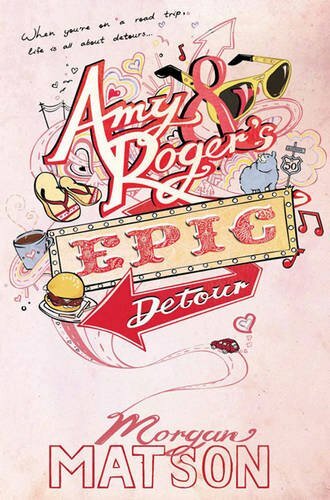 It’s not a journal, but it’s a step by step account of almost-strangers-brought-together-by-their-moms-in-a-moment-of-convenience, Amy and Roger and their road trip from California to Connecticut. Amy can’t drive Amy won’t drive. It’s a fear, born out of tragedy (I’ll never tell, you’ll have to read). Anyway, it’s arranged that Roger will drive them both because he needs to pay his father a visit in Philadelphia anyways. Amy is kind of annoyed that she has to spend four days cramped up in a car with a boy whom she believes (despite her mothers insistence that they used to play Spud together when they were kids) is a complete stranger. ME: This is a book bursting with characters. YOU: But Louise, that can be disorientating, right? ME: Right. Not the case here though. Each new character is unique, has their own voice. Morgan is good at that; defining each character as an individual through dialogue. Sometimes, when I’m reading a book, tailored (for the most part) around two MC’s, and they’re having a conversation, the reading voice in my head sounds the same. With each new character that Morgan introduces my inside-head reading voice changed it’s accent. Their not superfluous characters either like some bit players in books can be. They all add a little something to this scrap-book story. What starts out as an uncomfortable slash awkward slash how could you do this to me mom? journey, ends up being a massive mission of discovery. Not just geographically emotionally too. Posted by bookishblurb on January 8, 2013 in Review and tagged Books, Contemporary, Morgan Matson, YA.